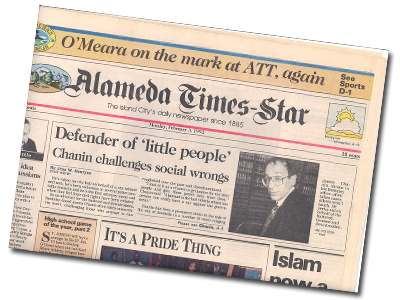 Mission | James B. Chanin, Esq. I became an attorney because I wanted to help people. I am not satisfied until I know that I have done everything possible to help my clients attain the result they deserve. I have pursued individual cases for up to ten years and have never quit trying to get justice for my clients. With over thirty years of experience, I know that it takes time, tenacity, and resources to get the right solution. When I take a case, I am ready to make that commitment. When I sue a public entity or a big corporation, I am aware that this is the one chance my client might have to be on the same level playing field as the rich and powerful. I do everything that I can to make that one chance make a positive difference in my client’s life. When I take a personal injury case, I am aware that the future of my client may depend on the outcome. I do not run a TV-oriented personal injury practice. I make it a point to know my clients well in order to get the result they deserve. When I represent a small or large business in litigation, I know that they want a practical outcome that will allow them to do the job they need to do. I am very conscious of litigation costs and their cumulative effect on a business, and I strive to do an exemplary and professional job with a minimum cost to my client. On the other hand, I am not afraid to try a case, and I will do what it takes to get the right result for my client. Copyright © 2010 James B. Chanin, esq.